Someone always gets hurt when couples dress alike, mostly the man but as we will see soon, not always. Two days until Megomeet, please check the Mego blog for more info. 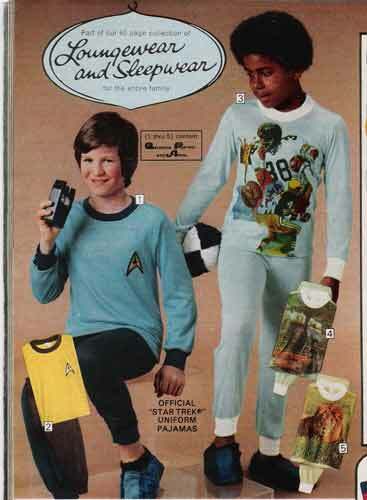 OK, maybe cool is a strong word, I mean parading around in these star trek pajamas might actually get you beaten up in some circles (the smug kid in this pic looks like he's about to receive one if he doesn't stop talking into that tricorder) but if i had seen these at 6 years of age, the first thing out of my mouth would have been "cool"
Isn't odd that the outfits from the first movie looked like pajamas? no? oh, never mind then. Bonus Toy Feature, the guys at the Megomuseum forums are discussing this weird 70's toy I know little about, the Hal Needham famous stuntman stunt set. I think their skin tight nature makes em worse. Four days until the big event of toy geekdom, Mego Meet. If you're in Ohio or PA, this is a really cool day trip. 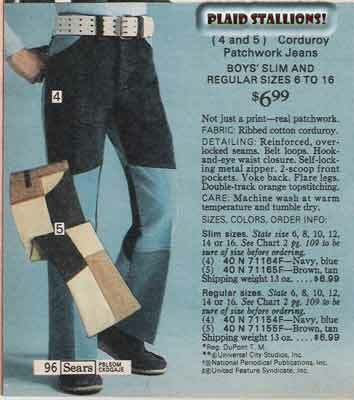 The 1976 Sears Christmas catalog has what I expect is a fad that I hope never caught on, corduroy patchwork jeans. 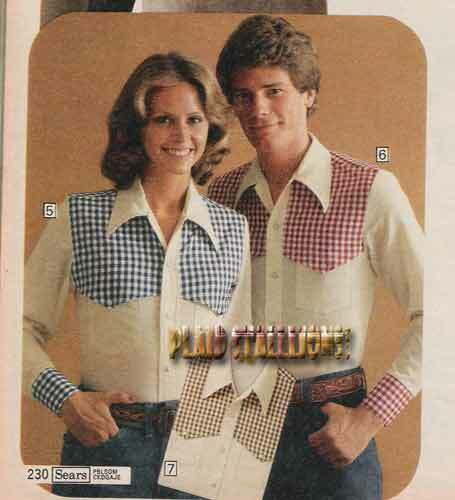 From the Herb Tarlek casual wear collection, be sure to top them off with the biggest, whitest belt you can find! That brown pair should have been destroyed on sight and whoever designed them run out of town by angry villagers. If you're not getting my drift, I think they're an eyesore. Next week more toys, more pajamas and some nifty ladies fashions, oh my! Maybe it's just me but I find this picture creepy. It's almost as if this is a snapshot from a film where these two have just killed an old friend in a heated argument or the guy in white has finally realized he's on a hunting trip with a total nutjob. 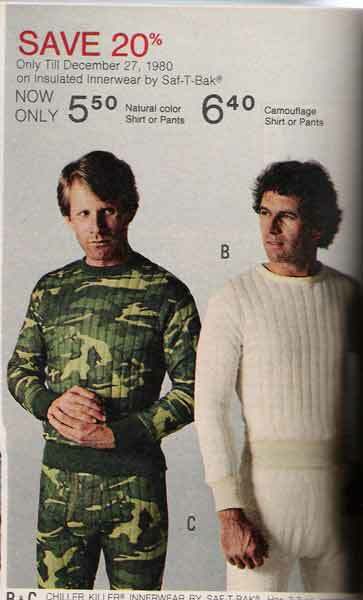 Perhaps it's just me, either way, I wouldn't be caught dead in this and certainly wouldn't be romping around with another dude while wearing it. The Megomuseum has listed yet another cool Mego Trading card, this time it's the Penguin. Scott managed to make even dorky figures look cool. There is something about this photo that just made me laugh and I had to post it. These kids look PISSED and I gotta wonder if this is the best take or if it was an extremely long day. Unlike most Catalog models, I didn't see much of these two in other pages either. Weirdness but I have worse than this coming up. I swear I'll use another catalog next week. Some Cool News: The Mego Museum is having a raffle to promote their amazing trading cards, the prizes are actual rare MOC Mego Dolls, pretty amazing. Tickets are $5 each. Forgot to add this brilliant ad from youtube, seeing as I'm on a Spidey kick today. I seemed to be obsessed with the 1980 JC Penney, I swear I have more catalogs than this one, it's just on my desk. 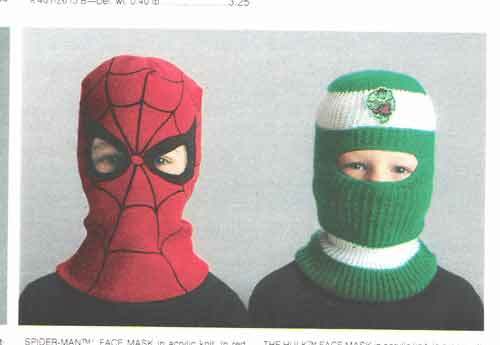 Here is something that I wish I had seen as a kid, the Spiderman Ski Mask. The kid wearing the Hulk one got gypped, that's a real stretch, shouldn't it have a tuft of black hair on the top? 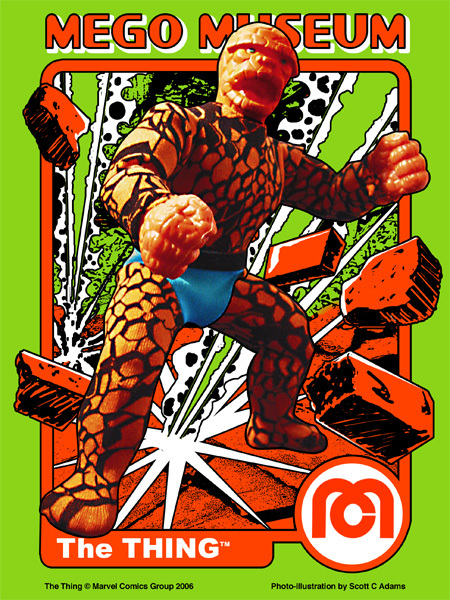 Speaking of Superheroes, my buddy Ben has updated his blog on his website World's Greatest Toys, which is the new book coming out about Mego Superheroes, check out the insanely groovy postcard he's sending out. Ben will be at the Mego Meet convention next week, showing samples of the upcoming book and handing out postcards, if you can make it, you should. 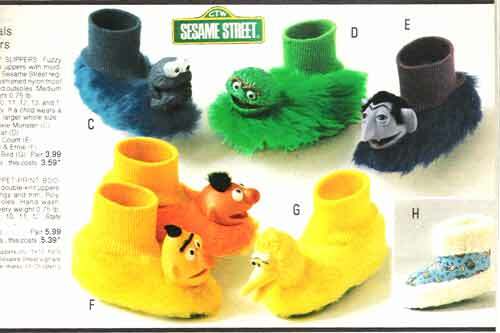 How come these things didn't make a comeback? 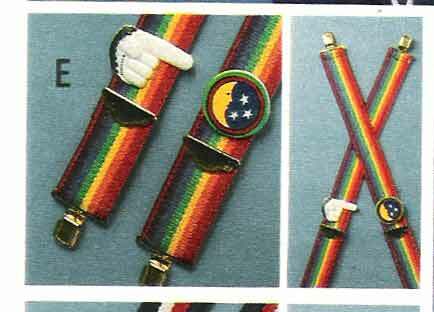 From 1980, these are official Mork and Mindy Rainbow Suspenders. 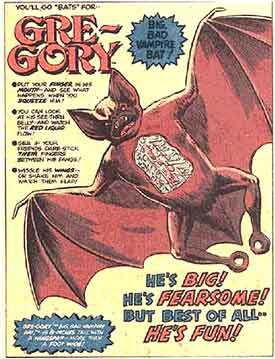 Gre-Gory thge Vampire bat of childhood disapointment! 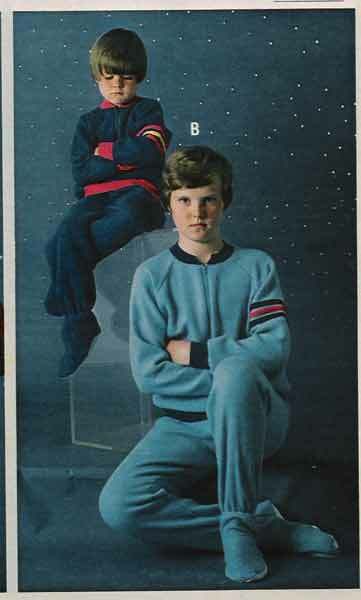 Fooling around through the 1980 JC Penney Catalog I came upon the Tri-fecta of evil, the three toys I wanted more than anything but never recieved. They are, in order, Mattel's Godzilla from the Shogun Warriors line, Rodan also from said line and the third and possibly worst of them all Gre-Gory. 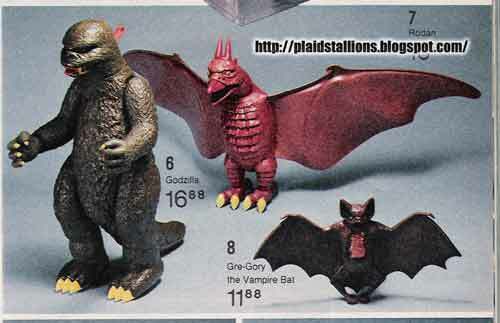 Godzilla was the only one of them I ever saw at retail, my friend had one so there are some fond memories, it's Gre-Gory and in particular the ad below that I remember best. One day while perusing a comic (probably Marvel's Star Wars) I saw this ad and went directly to Woolco armed with Grandma, they didn't have it. Mattel Canada never carried the thing.. After 20 years of toy collecting, I've never even seen one of these things up close. Today I own that Godzilla and Rodan but it's sort of hollow, my main childhood memory is wanting them, not playing with them. I let my son fool around with my Shogun Warriors now because he has a lot of fun with them. 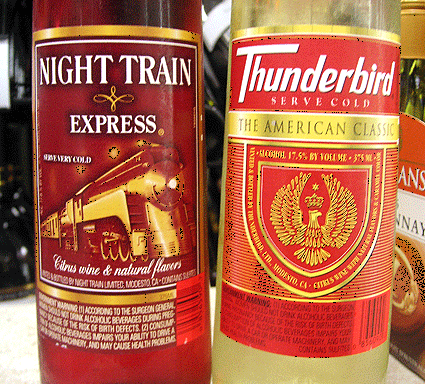 For about 14 years I have collected bottles of Thunderbird wine, friends and loved ones never quite understood why, especially after the rare opportunity to sample it. It was a joke that I seemed to share alone. Goofing around on the net, I found the website Bumwine which seems to be a kindred spirit. Bumwine gives an interesting history on T-Bird (it's by Gallo!) 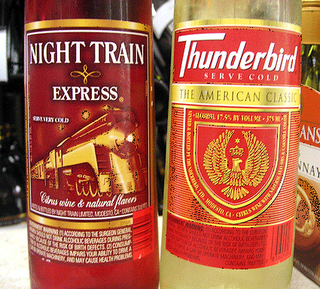 as well as Night Train and "Mad Dog" 20/20. The site also ranks taste (T Bird ranks as the worst), warmth and it's ability to eff your s*it up (T Bird came in second). The only thing the site is missing is the Canadian Equivilant, Baby Duck, which tastes like grape soda and Alcool. They still make Hai Karate! I'm shocked that you can still buy Hai Karate in the UK. I've always wanted a vintage bottle but find it a little pricey. When I was about 13, I remember seeing these Dungeons and Dragons figures in stores, because they had Grand Toys logos on them, I assumed they were by Mego. 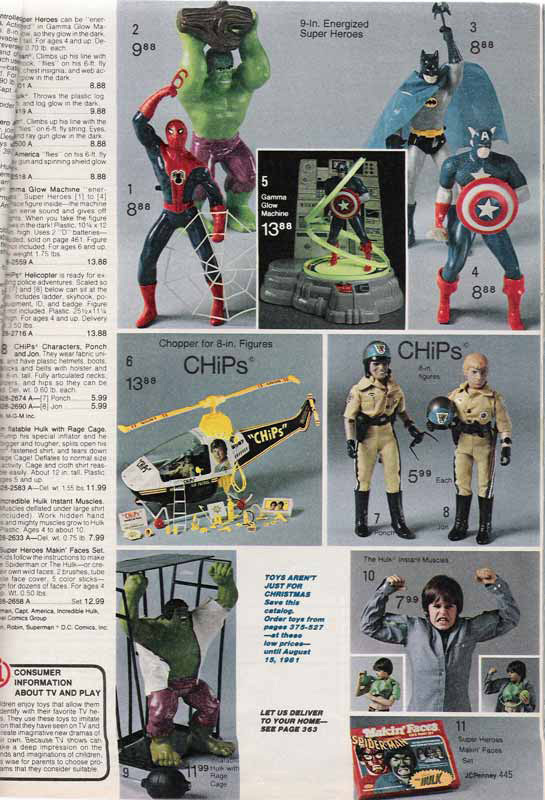 Most of the cool Mego figures were distributed by Grand in the late seventies, including Pocket heroes and Micronauts. It wasn't until years later i discovered that LJN had made the figures (and tried to buy Grand actually) and Mego had gone belly up. 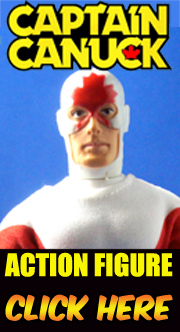 If you like Mego, then there is a new book coming out on the Superheroes that looks amazing. It's amazing what's being offered in this auction. Six Sears Wishbooks, all from the seventies, ugh! As a catalog collector I'm in love, as a mego historian (boy that sounds dorky) it makes me wonder what I'm missing out on in those pages.